1. Recognize that customers, not you, are the real hero of the story. Great brands help their best prospects realize their personal hero’s journey. Resist the temptation to talk too much about yourself. Stay focused on your prospects. 2. Put the needs of the right-fit prospects first. Begin your project by writing various use cases that capture the functional wants and psychological needs of your best prospects. To arrive at these, conduct primary research and review all secondary research you can find. Understand elements of brand value. Identify distinctive hooks that appeal to your prospects. 3. Sharpen your business strategy and your authentic brand position. Ask your senior team simple questions: “What do you want more of? Who do you want more of? and Why?” The answers will help identify your most desirable prospects and how you wish to grow. Use these insights to test the user experiences you create. 4. Protect the franchise and liberate new prosperity. A brand can neither fulfill its mission nor grow without money. A website should protect your core business, and expand into new markets/segments you can service well. All the hard work of strategy and planning is wasted if the website isn’t beautiful and distinctive. Hire the most talented designers to create your website experience. 6. Leverage technology to deliver the wow and ease-of-use. The smoothest user experiences are usually created by heavy lifting by frontend and backend developers. Hold the tension between these two opposing forces. Surprise the prospects with judicious deployment of carousels, slideshows, progress bars, accordions, filters, auto-completes and facet searches. 7. Infuse Persuasion Architecture at every level. The Sitemap (org structure) and Wireframes (page schematics), and not just design and copy, should make a compelling argument. Balancing logic and emotion, stories and facts – progressively disclosing the information all help create brand preference. They all help prospects mitigate the risk of choosing your brand. 8. Ask for the business. Persuade first, then ask, but don’t over-ask for the business. Quiet confidence wins. Lead the prospects to take the next steps. 9. Bake Search Engine Optimization and social into the user experience. Since Google page one is the surest path to prosperity, weaving SEO and social thinking into every step will give your brand natural gains and momentum in achieving critical page one rankings. Well-constructed websites should naturally pull close to half of website traffic from search engines. Paid and social campaigns should be deployed to augment the natural momentum. 10. Follow up, deliver and sustain. User experience design elevates expectations in follow up, delivery and customer service. Use the website redesign project to re-examine and streamline your business operations. Keep the website up-to-date with a toolkit including Keyword Lexicon, Brand Guide, and Content Governance Guide. Creating great digital experiences is a highly collaborative process between business strategists, brand architects, user experience designers, story tellers, content strategists, interactive designers, front-end/back-end developers, search engine marketers, and your core senior/operating teams. Employing these best practices is a labor of love with potential gains in reputation, revenue and rankings. After we helped reimagine, redesign and redevelop their websites, many of our clients have experienced inflection points in their business history. If you are considering hiring an award winning, experienced agency which can help create a game-changing website, possibly an inflection point in your history, contact us. 1. Balance Institutional Priorities and the Greater Good. Honor institutional priorities by enrolling legacy students, full-pay students, donor students, athletes and other priority students. Create a healthy school culture by enrolling the best-fit students. Create a sustainable society by recruiting and providing support for both under-served and under-represented students. 2. Invest in First Impressions. Brand your college because in the sea of sameness, brands win. Fortify every touch point – including websites, social media, open houses, information sessions, grounds, classrooms, tours, and admissions office décor. 3. Embrace Digital Search. Abandon Traditional Search. Reduce your reliance on traditional funnel methods based on purchased names. These drive “softer” prospect interest and leads that require more support — manpower and aid money — for conversion and retention. Remember that pouring large number of prospects into the traditional funnel may allow a college to become slightly more selective in shaping a class, but it rarely taps into deeper “right-fit” connections. Along with additional churn that comes with traditional funnel methods, you risk diluting “lifetime student value.” That dilution does not reveal itself for a long time — maybe not until those alumni rise to the ranks of future major gift donors. Create and publish high-fidelity content – stories, infographics, stats, videos, quizzes/calculators, contests – on your website and social media channels. Not only do leads generated there outperform paid advertising leads by three-folds, paid advertising leads also out-perform purchased names by three-folds. The best prospects prefer to “discover” the college of their choice through word-of-mouth on social media and “accidental finds” on Google page one. Don’t let automation get in the way of personalized and timely follow-up. Offset reduced contact with stealth applicants by stepping up the game at each touch point. Pay as much attention to the follow-up and yield communications as you do to the lead-generation and lead-nurturing communications. 5. Let Data Guide Decisions. Use data to give legs to your intuition. Don’t surrender your judgement to data. Take bold action once you gather the insights from your data. 6. Invest in People, Process and Technology. To generate predictable enrollment, invest in the right mix of talent (e.g. strategists, external partners and team members), processes (e.g. 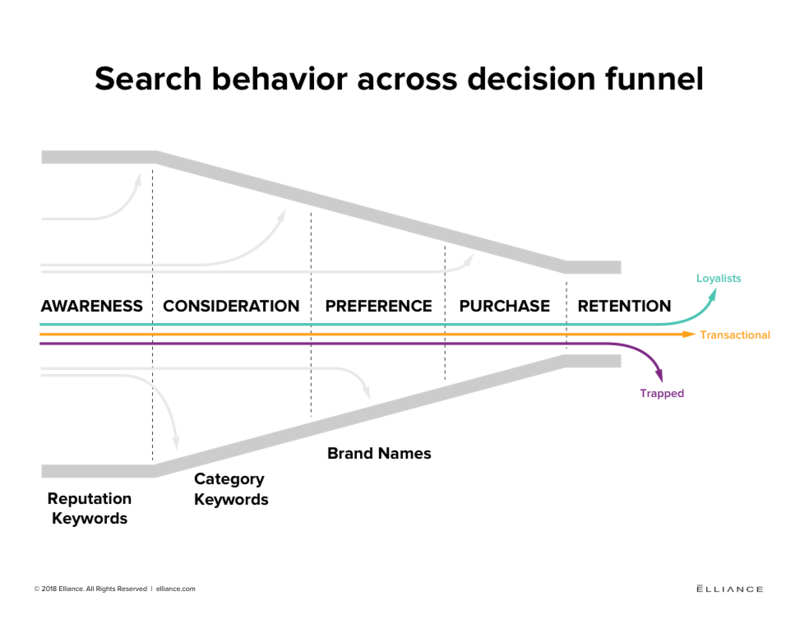 communications plan for every stage of the admissions funnel) and modern tools (e.g. CRM, marketing automation software, and lead attribution software). Fight the good fight to influence the organizational reporting structure because it determines whether your college will survive or thrive. 7. Focus on Lifetime Student Value. Provide robust academic support, career guidance and campus experiences to your students. Graduate brand ambassadors that become future donors and referral generators. Support institutional initiatives that are consequential and support meaningful causes. If you are ready to hire an enrollment consultant who can help create a soulful enrollment machine, consider contacting us. Every year, a silent, high-stakes dance takes place in all the 4,000+ colleges and universities in the US. To meet their enrollment targets, the colleges look for the best-possible group of students who will apply, and then accept the offers extended to them. Lead generation with College Student Search is the first step in this ritual dance with a singular objective: to generate an initial list of best-fit, most-likely-to-apply-and-subsequently-accept high school students. This was the textbook strategy for student search. Enrollment professionals bought tens of thousands of prospective student names from various sources – at a price ranging from 20 to 40 cents per name. Then they sent them a series of emails and direct mail pieces with the hope of getting some of them to raise their hands indicating interest in the college. Most enrollment professionals are still stuck in this antiquated numbers-game strategy i.e. cast out a wide net, see what you catch, and do everything in your power to hang on to as many of them as possible. After living a long life of three decades, this traditional strategy is about to expire and is being replaced by a new strategy. In the “Inverted Funnel” strategy, colleges are creating authentic student/alumni/faculty stories on their website and social media channels. Social sharing with friends, friends of friends, and friends of friends of friends results in them raising their hands. This relies on the classic “birds-of-a-feather” approach. A second element of this is to take advantage of new micro-segmentation and 1-to-1 marketing opportunities that Google, Facebook, LinkedIn, Twitter and other social platforms have started offering in the last two years. For Facebook, this includes micro-segmentation, look-alike audiences, and lead ads. For LinkedIn, this includes account targeting, matched audiences and lead-gen forms. For Google, this includes similar audiences, geo-targeting and variations of local ads. 1. Quality: Traditional funnel methods drive “softer” prospect interest and leads and require more support — manpower and financial aid money — for conversion and retention. 2. Fit: Pouring large numbers of prospects into the traditional funnel may allow colleges to become slightly more selective in shaping a class, but rarely taps into deeper “right-fit” connections. 3. Lifetime Value: Along with additional churn that comes with traditional funnel methods, colleges risk diluting “lifetime student value.” That dilution does not reveal itself for a long time — maybe not until those alumni rise to the ranks of future major gift donors. 4. Reach: Compelling brand and mission messages, and digitally targeted content, allows colleges to extend their reach nationally and globally. 5. New Habits: Gen-Z and millennials are now spending most of their time on mobile devices, trusting peer opinions more than the messages coming from marketers. As one faculty member at one of our clients so eloquently said: “passion and belief in the mission is much more than a line on a resume” (or an enrollment application). 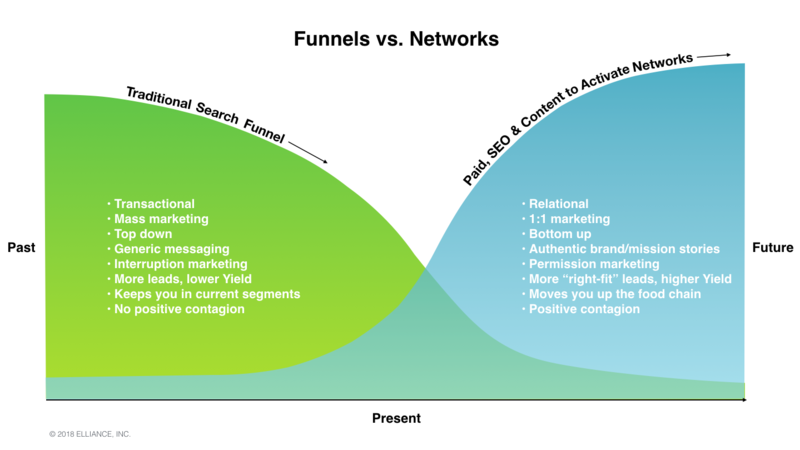 Traditional funnel and email campaigns impose a top-down construct that doesn’t invite “right-fit” passion to surface. Staffing for this digital future will be critical. Key enrollment, advancement, communication and marketing hires will ultimately decide your ability to cross over from a traditional enrollment funnel to a new integrated, digital reality. Learn more about our enrollment marketing services and contact us to discuss how we may be able to help you design, develop and implement digital student search campaigns. Part joke, part poisoned-tipped joust, the heralded Knight voiced an ambivalence about writing and writers that lingers within many college marketing departments and their creative agencies. Entire blog columns and books have advanced the notion that “content is king.” That idea traces to an 1996 essay by Microsoft founder Bill Gates who envisioned an Internet buoyed by fresh, enlivening content. Google Ngram shows that phrase rocketing straight into conventional wisdom. One could argue the theory, but the eye test says otherwise — the vast seas of web content carry mostly ephemera. My first digital assignment — a 155-character meta description — began my re-education in a new hyper language, one that promised greater speed and potency. As newspaper writers, we learned a seven-second rule — the average time a reader engaged a news or feature lead before deciding whether to continue. In the digital world, a second’s worth of someone’s attention felt like a gesture almost too full to imagine — or accept. In this way, both writer and reader share responsibility for the spread of oversimplification. Did we first lose the habit of mind — our ability to read for meaning — or did we slowly stop caring much about the merits of any one piece of communication, conditioned by a tsunami of junk content? Either way, Knight’s glancing insult now sounds like something of a premonition. We no longer make time for careful story planning or reporting. Training and craft — even basic rewriting — have become luxuries. Today, everyone writes, everything, all of the time, ostensibly on their way to achieving “greater” things for clients and colleges. Content managers and management systems underscore the operational paradigm — efficiency over effectiveness. In this mechanistic environment, story has become endangered. Even as we marvel at the power of a good story to sustain global religions or topple empires, we find it too time consuming or burdensome to report our own. While many colleges crave the rewards of great content — sincere audience connection, brand loyalty, unmistakable voice — few hire enough skilled writers to see any of it materialize. Marketing and communications teams, some staffed with fine and experienced writers, can easily get reduced to content sweat shops. Any impulse to write well or read for meaning must defer to a more pressing concern — curbing the (Google, Facebook, Instagram) algorithm’s appetite. One can only have high admiration for those higher education marketing teams and institutions that keep the story faith and carry on. Despite everything, your insistence on reporting and telling human-scaled stories and speaking in an authentic voice will return lasting dividends. Should you find yourself short on inspiration, look to smart retail for encouragement. Why did Apple find their voice, while Microsoft fell short? How is it that Southwest celebrates a brand vocabulary filled with self-expression and tiny gasps of joy, while other airlines stay grounded under the weight of formality and procedure? In my experience, another inspiration is music. Like music, story and voice use language, but never language alone. They communicate with tone, color, vibrancy. Breath and pitch. Half and full notes. The strategic value of good writing can easily fade amidst so much noise. Remember, voice is trust. A clear signal sent and received, time and again. Why hire, nurture and value great writers? For starters, they will help to restore trust, and allow you to build and sustain the tribe. Whether we’re working on higher education website design projects or marketing campaigns, SEO strategy is always central to our thinking. We always start by creating an SEO Keyword Lexicon that guides our content creation and optimization efforts. The Keyword Lexicon includes different types of keywords that a prospective student will use at different stages of their college search process. Here’s an infographic that illustrates the various stages in the search process and the type of keyword used at that stage. At the beginning of the college search process, people tend to use broader keywords looking to build awareness about possible options at that time. One way to start the search process is by using reputation keywords – using “top” and “best” keywords as you look for the most reputable solutions. For example, someone searching for MBA programs in Pennsylvania will start their search with keywords like ‘top MBA programs in Pennsylvania’, ‘MBA programs in PA’, ‘best MBA programs in PA’, ‘best value MBA programs in Pennsylvania’, etc. The next phase for a prospect comes when they feel they are familiar with the options available. They will use phrases that are more specific to what they’re looking for, in other words, category phrases. For example, the MBA prospect may be looking for an MBA with a focus in Business Analytics. Their next step will be to use words that refine their search to be more specific to what they’re looking for. In this case, our prospect will most likely search for something along the lines of ‘MBA programs in business analytics in Pennsylvania’. As the prospect builds familiarity with the pool of options available, they will start to build a preference for the brand they like and in turn use branded keywords in the search process. As the prospect gets closer to the decision-making phase, these branded terms will become more frequent, eventually turning into a preference for a brand and an eventual decision. Elliance SEO strategy is to write content and optimize it to ensure our clients are ranked on search engines for keywords at each stage of the decision funnel. Learn more about Elliance higher education marketing services or contact us. What’s so great about Instagram in the higher education space? I wrote a blog about Instagram and higher education a couple of years ago, and I think that it is a good time to revisit how universities can make the most of their Instagram presence. So, without further ado, here’s a quick Q&A with me, about Instagram in the higher education space. Q: Why should my institution care about Instagram? A: Because your prospects and current students care about Instagram. According to a social media survey by RBC Capital, 73% of 13- to 18-year-olds surveyed said that they had an Instagram account. SEVENTY-THREE PERCENT. If 73% of the prospects you’re trying to reach are standing in a room, shouldn’t you also be in that room? Teens care about Instagram and they’re actively engaging with the community every day. In a CNBC article about social media trends and teens, one 18-year-old is quoted saying “I feel that Instagram is still the most-used social media platform for people my age, and pretty much all of my friends use it on a daily basis.” Because these users are coming back every day, sometimes every hour, Instagram presents institutions with the opportunity to share a multitude of different messages with their audience, at a frequency not possible on most other platforms. Q: What is the advantage of using Instagram to tell our story? A: There are a lot of advantages, but I think the greatest advantage is expanding your reach. Instagram is a well-established community that your prospects already frequent and love. They stop by daily to explore content and engage with their friends and brands that they admire. Hashtags and locations tags present institutions with an opportunity to organically put their brand in front of new prospects that they may miss with traditional digital campaigns. While also offering the opportunity to promote or sponsor posts targeted at specific users based on selected likes or attributes. Hashtags are added to captions to make a user’s post appear in a curated list of other user’s posts that are associated with the same word or phrase. For example, the official Olympic hashtag is #BestofUS. News outlets, blogs, brands and athletes will use the hashtag in order to ensure that their content appears in the curated list of other Olympic content. Thus making it easy for users to browse content related to the Olympics in one place. A college or university may use a branded hashtag that is specific to their institution, like Kenyon who uses #KenyonCollege to curate a list of 8,642 posts. The #KenyonCollege list is an authentic 360 degree view of life on campus from both the institution’s perspective and the community’s. Geo or location tags work in a similar way. Instagram has an explore feature that uses an algorithms to generate a unique feed of content for user’s based on their interactions and the interactions of the brands and people they follow. For example, if a prospect that has already applied to your institution likes a post on your account, the algorithm may serve that same post up in the explore section of their friend. It’s like word of mouth… but through a social media algorithm! This reach can also extend to international students. 80% of Instagram’s users reside outside of the U.S. And Instagram boasts over 800 Million active monthly users. That’s a lot of potential international recruits. Q: Followers are great, but will prospects go to my website or request more info? While there’s no guarantee that a prospect will engage and convert on any platform, one survey found that 75% of Instagram’s users take action, such as visiting a website, after looking at a brand’s post. And those are just the users that we can track. I like those odds. Interested in learning more about how your institution can make the most of your Instagram presence? Contact us today to speak with our social media experts. 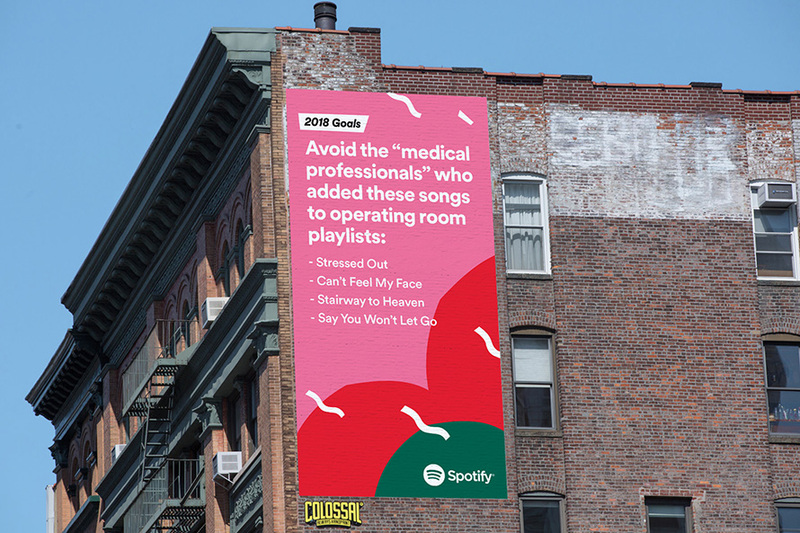 I remember walking along the New York City High Line — a Queens railway turned scenic nature path through Manhattan — and looking up to see one of Spotify’s vibrantly colored billboards on the side of a nearby building. It captured my attention. It made me laugh — not just because it was witty, but because it was relatable. As I took in the ad that reflected absurd and comical listening habits Spotify had observed from users over the year, it made me recant my own Spotify experience and reflect on what my own musical habits say about me. 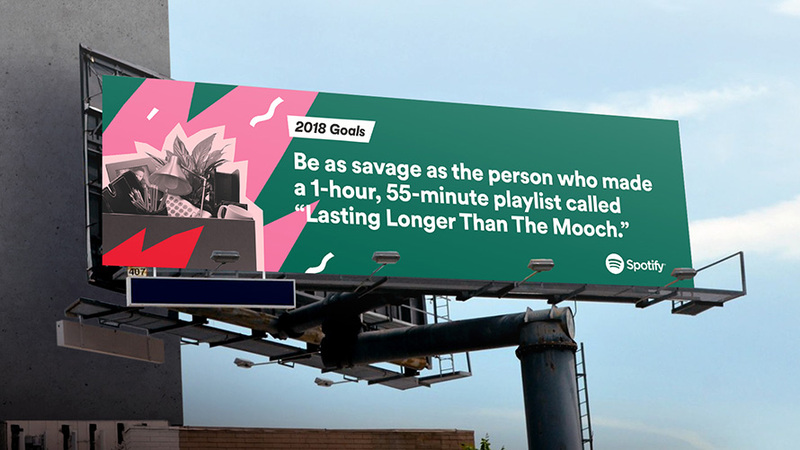 The theme of Spotify’s ad campaign this year is “2018 Goals”, recognizing the ups and downs we’ve experienced in our country and across the globe this year and translating user data into clever headlines that humorously offer suggestions for embracing everything 2018 throws our way. If you haven’t seen the ads, you can check them out here. I’ve included a few of my favorites below. Spotify does a beautiful job here of allowing the data to speak for itself in this refreshingly direct and personal approach. Rather than making assumptions or grandiose claims about a general population, they use direct data examples and show individual listening habits, which in turn taps into the collective mood of our country and world as we’ve experienced the weight of tremendous political, cultural and natural forces this year. Spotify’s ability to collect massive amounts of user data gives vast insight into the collective and individual attitudes of its listeners and allows the company to create both shared and personalized, individual experiences for its users. 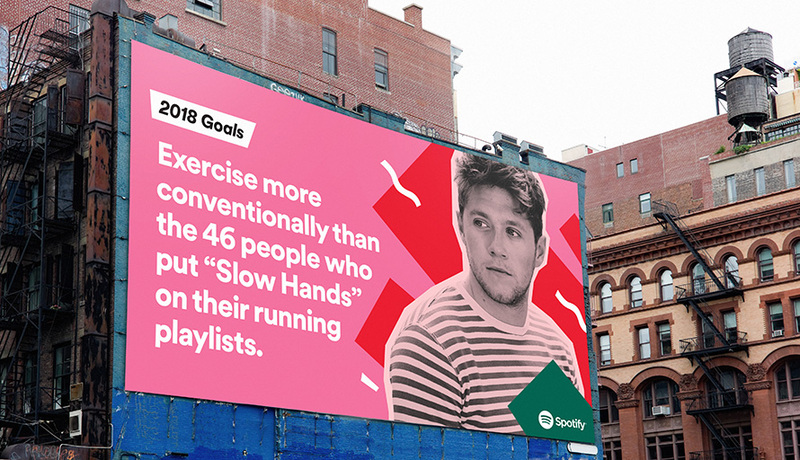 Beyond its out-of-home campaign, Spotify tracks individual users listening habits and uses that data to deliver a customized listening experience, including weekly recommendations of songs you might like based on your previous listening history. I can say in my own personal experience with Spotify that these recommendations have led me to discover some of my favorite bands and spurred me on to numerous concert-going experiences. In this way Spotify’s data-informed user experience not only aids listeners in their pursuit of new music, but helps new and upcoming artists get their name out there. Spotify also delivers each user a personalized year-in-music wrap-up, a feature they titled “2017 Wrapped” this year. This individualized dashboard of your musical habits shows you what you listened to in 2017, what artists you helped make popular, what moods you were in during different periods of time, what genres you gravitated toward this year, your most played songs and artists, and more. From a very direct, customized user experience to witty, data-driven, listener-centric outdoor ads, Spotify sets a precedent for using data-derived analytics to make listeners feel seen and heard on an individual level as well as unified as a collective whole. At Elliance, our digital team uses real-time data as well. And although it is not used in the same direct manner seen in Spotify’s out-of-home ads, it is an essential part of our marketing process. It drives our strategic thinking, from content creation and optimization to keyword targeting and image selection, as we create successful campaigns that lift the voices this data represents. We utilize A/B testing with the ads we generate to give insight into which creative messaging and images connect with the audience. Our team also observes traffic patterns and engagement numbers to inform creative strategy for blog content and infographic creation to ensure we produce content that resonates with the target audience. If you’re ready to take your business or institution to the next level, expand your reach and better serve your audience, you’ve come to the right place. Contact us today to learn about how we can elevate your brand and help you reach your business goals. Well-capitalized, community banks often grow new customer relationships by acquiring other banks. However, as their geographic footprints expand, many find it challenging to also grow new customer relationships organically. As their DMAs widen, their marketing budgets are spread thinner and thinner. The idea of spending money on television, radio and outdoor grows more untenable, and digital becomes more important than ever. If this is where you find yourself, your digital marketing strategy should take the following realities into consideration. 1. Relationships are everything. The lifetime value of a customer whose financial needs evolve through many stages of life is worth far more to your bank than the interest earned on a one-time transaction. It’s interesting when you ask people “Who is your bank?” Invariably, their bank is where they keep their checking and savings accounts. The same is true with business customers. This is where long-term banking relationships begin. 2. You sell more loans to existing customers than anybody else. This is because the first place people go shopping for a loan is at their bank. When they do shop elsewhere, they soon discover that the promotional rate they’re being offered requires that they open a checking account. People often walk away from these deals, because they want to keep their checking account at their bank. 3. People don’t change banks very easily or very readily. When they’re ready, you want to be on the top of their minds. This is why the smart money is spent on building your brand, not on pushing loans. 4. Community bank customers are banking there for a reason. Community banks are invested in Main Street lives, businesses, causes and institutions. They’re woven into the economic fabric of every locale they operate in. Don’t let your brand lose sight of this. 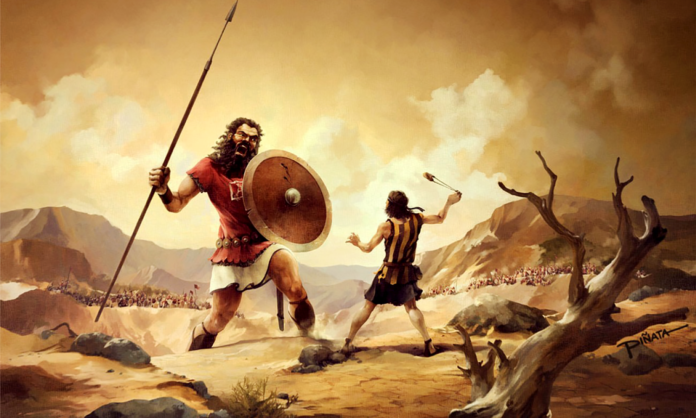 It’s why your customers love you, and aren’t banking with a corporate goliath. Use this to your advantage. Digital marketing is how you’ll level the playing field with your larger, well-heeled competitors. Here’s what you’ll need to accomplish. 1. Win zip code by zip code. Branch by branch. Your strategy should aim to win new customer relationships in every single place you’re located. 2. Have Google point people your way. Look at every city and town where you have a branch. Every person there who Googles “Banks” should find you at the top of page 1. When people Google “Home Equity Loan” they should find you at the top of page 1. The same goes for every other product you offer too. 3. Target those who fit you best. Give a lot of thought to who your loyal, and best customers are in the places you have branches. Who are your tribes? These are the kind of people you should have more of, and these are the sort of people who should see your bank when they’re perusing Facebook and LinkedIn. 4. Make sure your website sends the right signals. When people visit, they should feel welcome and at ease. Everything should be right where they expect it. And most importantly, new people should be able to see themselves banking with you. This means saying goodbye to those folks from the stock photo library that every other bank uses. 5. Keep the door open. Once people leave your website, make sure they continue to see you online for a while. Delivering on your digital opportunity requires integrating the diverse talents of marketing communications strategists, website developers, user experience designers, data scientists, search, social and content marketers, writers, designers and artists who are all focused on helping you achieve your goals. This is the sort of challenge that the team at Elliance is built for, and we welcome talking to you about what the marketing challenges your community bank is facing in 2018. Please contact us here. In a recent post titled “ADA Accessibility Compliance for College and University Websites,” the question of how to ensure WCAG 2.0 compliance was covered briefly. In this post, I will expand on a couple of the challenges of making an existing website compliant. Bringing an existing website into compliance can be extremely tedious depending on the technology it was initially created with, any subsequent patches to this technology, and any themes, plug-ins, or modules which extend the site’s functionality. For example, let’s consider an existing website using WordPress, which by some accounts powers 26% of the Web, and commands almost 60% of the Content Management System (CMS) market share. While WordPress is a great open-source CMS, and affords you lots of control over the content being generated, their ecosystem does not come without caveats. On top of WordPress’s backend core of functional code and database, sits the visual design in the form of theme templates. While the WordPress Accessibility Coding Standards state that “All new or updated code released into WordPress core and bundled themes must conform with the WCAG 2.0 guidelines at level AA,” note that this policy covers only core code and themes that come bundled with WordPress. In our experience, most sites tend to use custom or third-party themes, and not the bundled designs. There are many marketplaces offering themes, and even the bundled themes can be copied and customized. Given this, and the fact that the WordPress theming system was created back in 2005, one must be careful to fully research and vet any themes for WCAG 2.0 compliance before employing them on the web. A main feature of the WordPress environment is a modular “plugin” system, where the more technically solid central software core, has its functionality extended by the use of user-contributed plugins. As of this writing, there are 53,755 plugins available for download. While some plugins are done very well, quite a few of them are of dubious quality. Even those that are executed well occasionally need to be configured (or even modified) to be fully compliant. While the template code for a recent project was compliant, one particularly popular social media plugin was generating non-compliant code. Specifically, the plugin was causing 42 unnecessary WCAG 2.0 errors by inserting Instagram and Twitter posts into the page which had incorrect markup. A check of the plugin’s settings revealed that there were no options for compliance. In a situation like this one has two options: find another plugin; or modify the plugin to generate compliant output. The former case adds a time component, as new plugins must be selected and vetted, and may require design changes. In the latter case, one must remember that any modifications to the plugin will have to be reapplied any time the plugin is updated—at least until the plugin’s authors add compliant features. Before employing any plugin on your website, we recommend that you verify the output being generated is WCAG 2.0 compliant. There are many other “gotchas” to consider when working to bring an existing website into compliance. In some cases—such as older websites still using Adobe Flash or other aging/deprecated technologies, or proprietary CMS systems—the consideration of more modern ways of authoring and serving content may signal the need for a comprehensive architectural review and bottom-up website redesign. As mentioned by the author of the original post, the best way to ensure a compliant website is to build it correctly in the first place. If you are fortunate enough to be able to start anew (or with a fresh redesign), why not move ahead confidently, aided by an experienced partner with knowledge and best practices gleaned from multiple higher ed projects. So, rather than wait while your internal staff struggles to patch a brittle system, engage a partner with deep experience to more quickly bring your web properties into compliance. In order for a web page to be successful, a user must visit the page. Getting a user to visit the URL is a great struggle, but after they make that decision there are dozens upon dozens of reasons why they will leave, and sometimes leave before you can get a chance to make an impression. Page loading speed, an intriguing design, and engaging content will help keep your viewers on the page, but for user with accessibility needs (be it visual, auditory, or physical), reasons for leaving your site may be overlooked. Part of ensuring accessibility to all users means following web standards which value proper use of HTML elements, using CSS responsibly, and designing for all types of users on all types of devices. Most development teams have milestones in the software life cycle where they check for accessibility issues—this usually falls near the end of the project. We use several software tools at our disposal that can look at a web page and identify accessibility errors and warnings. These tools are very helpful when dealing with ADA compliance for higher education websites since they tend to be rather large in scale and scope. Catching potential error earlier, in the design phase, is even better. There are several plugins and tools for your design software of choice to minimize specific contrast errors. One of the easiest ways to test this is to make a quick HTML/CSS style guide and run that through the online or software based accessibility tool you are evaluating. With these extra checks early in the design process you can confidently move forward knowing that late life cycle design changes are minimized.